The marathon is arguably the most significant of all running events, certainly in the eyes of the general public. It is the event that generates the most buzz and the most press coverage. It may be that watching a marathon, either on television or on the streets, is what inspired you to take up running in the first place. Despite this ubiquity, many people might just not be certain what a marathon is, how long it is, how many there are, and how to go about running one. With this in mind, Lonely Goat RC present our beginner’s guide to marathons. A marathon is a foot race* of 26 miles and 385 yards. This is 42,195 metres, in metric, and is the standard distance that all marathon must be if they are to be considered a marathon. Marathons vary in the number of competitors, terrain, hilliness, location, level of crowd support, weather, and a whole host of different factors, but the one thing they all have in common is the distance. If you’re struggling to visualise it, this is equivalent to 8.439 parkruns, run one after the other. Yes, it’s not just London, though you could be forgiven for thinking otherwise. In the UK, the London Marathon, which takes place every April, is the marathon that gets the most coverage and is broadcast live on the BBC. As a result, it is often referred to as the marathon, as though no others exist. The reality is that there are loads of marathons. Around the world, there are the six ‘World Marathon Majors’. As well as London, these are Berlin, Boston, Chicago, New York and Tokyo. These are the highest profile marathons in the world and attract the very best professional runners and tens of thousands of everyday people – known as ‘the masses’ – behind them. Beyond the Majors are a whole world of other marathons. From slick, professionally run city marathons (like Manchester and Brighton in the UK; or Paris, Rotterdam, Frankfurt or Valencia in Europe), through smaller scale but popular events (like Abingdon or Snowdonia), through to small, running club organised races with a few hundred competitors (like the Isle of Wight or Bewl Water). Most are run in the spring or autumn as the weather is better (not too hot, not too cold), but there are also marathons that take place year round or are held in extreme places such as Antarctica and the Sahara. A quick internet search will bring up more marathons than you could ever possibly hope to run. And then, of course, the marathon is also run as part of the Olympics, Athletics World Championships, Commonwealth Games, and other elite international athletics competitions. Unfortunately, unless you have ambitions of being one of the quickest marathon runners in your country, you’re unlikely to be running in any of these. What about Half Marathons or Ultramarathons? A half marathon is exactly what it sounds like. 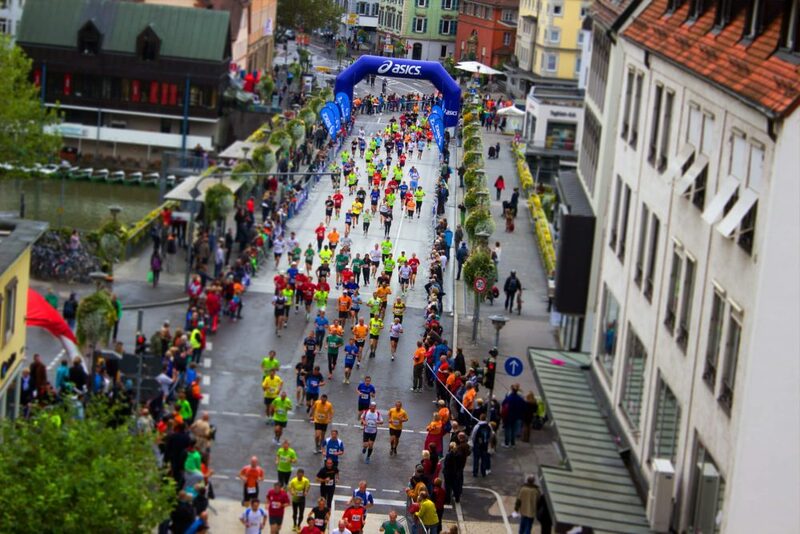 It is a foot race that is half the distance of a marathon, at 13.1 miles, or 21.1 kilometres. They are often used as a stepping stone up to the full marathon distance, but they should also be considered as important events in their own right. An ultramarathon, often known simply as an ‘ultra’, is harder to define as it refers to any race longer than a marathon. Yes, there are people for whom a marathon is not long enough. An ultramarathon could be 50km, 50 miles, 100 miles, 24 hours, or a race that covers hundreds of miles and is split over a week. The variety of ultramarathons is vast. What makes marathons so special? A combination of factors have led to marathons capturing the public imagination in the way they have. Firstly, there’s the history. The marathon name comes from ancient history. There are different versions of the story, but it is said that a messenger called Pheidippides ran the 25-ish miles from a town called Marathon to Athens to announce the defeat of the Persian army in 490BC. He ran so hard that he is said to have keeled over and died after delivering the good news. In 1896, the organisers of the first modern Olympic games in Athens wanted to include a race that would be really long, attract the best runners, and hark back to the history of ancient Greece. They called it the marathon and the first one was just under 25 miles, run from Marathon to Athens. Over the next few years there were other marathon races, that were similar in distance, but there was no agreement on quite how long they should be. At the 1908 London Olympics, the marathon was run from Windsor Castle to White City Stadium, with a little bit extra so that the race could finish in front of the royal box. The distance was 26 miles and 385 yards. After a few years of discussions, the international athletics bodies agreed to use the London distance as the official distance that all marathons should be run over. Thus, every single marathon can be considered to have 2,500 years of history behind it. The distance may have been arrived at more or less by accident, but seems to occupy a sweet-spot between speed and endurance, or difficulty and ease of achievement. It has been described as the ‘everyman’s Everest’. Provided you are willing to put the work in by training diligently beforehand, most people can cover the distance – but it will be hard. You might not be able to run the whole way and need to walk for part of it, but that’s OK – it’s the distance that counts. As runners improve, the marathon takes on a different level of difficulty. It is no longer simply about getting to the finish line, but trying to do so quicker than before. The pursuit of a marathon personal best (PB) can be addictive, as runners seek to find the limit of what their body is capable of. At the extreme end, the very quickest runners in the world look like they’re almost sprinting the whole way as they push the boundaries of human achievement. Yes, probably. Unless you have a health condition that might preclude you from doing so, most people can run a marathon provided they are willing to put the time and effort into doing the training – but it will be hard. There is no hiding in a marathon. You might be able to scrape through a parkrun off no training and a hangover, but if you try to do so for a marathon you will suffer for it and jeopardise your chances of success. Instead, think of a marathon as being the final 26.2 miles of a process that begins months beforehand and will most likely involve you doing more runs and more miles in training than you ever thought you could. Your level of commitment and mental strength is just as important as your physical ability. Even if you’ve run plenty of other, shorter races, the marathon has the potential to challenge you in ways that you won’t be familiar with until you try one. One of the biggest challenges for a marathon runner is how to get enough energy to run all that way. In an ideal world, your body would get all its energy for running from glycogen, which comes from your food and is stored in your muscles. This is because glycogen is an easy fuel source for your muscles to ‘burn’. Unfortunately, to cover the distance of a marathon, most runners will need to use more than 2,500 calories of energy, which would require more glycogen than your body can store at any one time. To overcome this energy deficit, your body has to start burning fat instead. Fat, however, doesn’t deliver quite the same ‘kick’ as glycogen, and is harder to burn, so the effort of running will feel harder. This is partly why runners often find that they suddenly start to struggle at around 20 miles, which is known as ‘hitting the wall’. To avoid hitting the wall, you could just eat loads of food during the race that is high in sugar and carbohydrates to top up your glycogen stores. If you have ever tried to run just after eating, or even tried to eat while running, this can be very uncomfortable and can lead to being sick or having to run to a loo. What all this means, is that the energy requirements of a marathon mean it is not quite so straightforward as having a big breakfast and heading out for a run. You will start to run out of energy and as you do so you will find it harder to keep going. To try and stop this from happening, you’re going to have to take on some extra energy, but not so much as to make yourself feel ill. Finding this balance and getting it right on race day is just one of the complex factors that make marathons such an exciting challenge. Another challenge is the sheer amount of damage you are going to do to your body during the race. You will take tens of thousands of steps, with each one contributing to the gradual breakdown of your muscle cells and inflammation of your joints. To prepare for this, it is important that you do a lot of running in your training before the marathon to strengthen your body against the sustained impact from putting one foot in front of the other, over and over again. It is one of the funny things about running marathons: You will spend months when you are tired and achey from all your training, just so that you can be the fittest you have ever been when you stand on the start line, only to go and put your body through so much stress that you’ll be barely be able to walk the next day! Don’t let this put you off though, because the sense of euphoric elation that comes from finishing a marathon can be one of the most wonderful, most overwhelming feelings you can ever experience. It really is the case that all that hard work means the eventual reward is truly special. Only a marathoner knows the feeling. OK, I’m sold. Now what? Sit down and assess your current running fitness and be honest with yourself: Are you ready to start marathon training? Everyone is different, so there are no hard and fast rules, but as a guideline, you should ideally already be able to run for at least an hour in one go, with a total of 20 miles (some would suggest more) of running a week, before you think about starting your marathon training. We’ll save the discussion on how to train for a marathon until another day, but there are loads of marathon training plans out there. They can vary quite a lot, but you could be looking at three to six months of gradually building up your distances until you’re ready to run your marathon. With this in mind, consider looking for a marathon that is at least six months away, if not more. Go to the website, enter the race, and book any travel or accommodation that you might need. Then, go through your calendar, marking in your training sessions and making them a priority. Next, tell your friends and family and apologise in advance for the fact that you will be spending the next few months feeling tired, eating loads, and disappearing off for hours at a time to go running. Hopefully they will be supportive and work with you to help you achieve your goals. And if they’re not, there’s always your fellow Lonely Goats to offer you support and encouragement. Jonathan is the Lonely Goat content writer. An experienced runner and brilliant wordsmith.